Anyone unsure of the direction in which Kia has been heading in the last year need only look at the impressive number of all-new vehicles they have debuted in these few short months. They’ve launched the quirky Soul, brought us the sleek Forte and most recently have started delivering the Koup (the Forte’s two-door derivative) to dealerships nationwide. 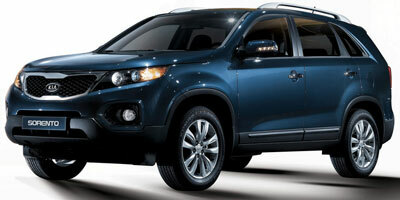 While the Sorento name has been around since 2002, the 2011 version is also brand new. From a complete exterior and interior redesign – instating the front grille already seen on the Forte – to a suspension component overhaul that dramatically improves the ride quality, the Sorento can’t be said to resemble much of the old Kia in any way. Instead of just a V-6, buyers now have the option of a four-cylinder engine, and extra features like a slick dual-pane sunroof and optional third row of seats make the Sorento a challenger in the crossover segment once again – a formidable statement considering it’s up against Honda’s CR-V and Chevrolet’s Equinox. The Sorento will be the initial vehicle to emerge from Kia’s first-ever U.S. plant, located in West Point, Georgia, and we think it will do the South proud. 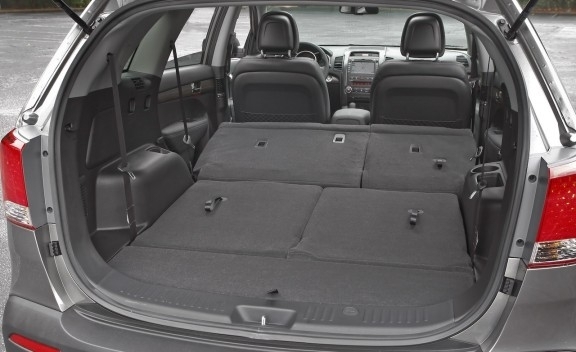 An optional third row is a first for the Sorento, helping it bridge the gap between the Sportage and Borrego. The V-6 does a great job of moving the Sorento along, but we’re glad Kia is now offering a budget-friendly four-cylinder. Interior styling is fantastic, especially with the touchscreen in place. You still can’t beat Kia’s 10-year/100,000-mile warranty. Brakes have zero feel to them, and the four-cylinder is a little thin on the power for such a large CUV. The transmission isn’t exactly a quickdraw either. The third row of seats isn’t going to comfortably fit anyone over the age of 10. Hard plastics still make up a lot of the surfaces, though they’re generally disguised by softening patterns. 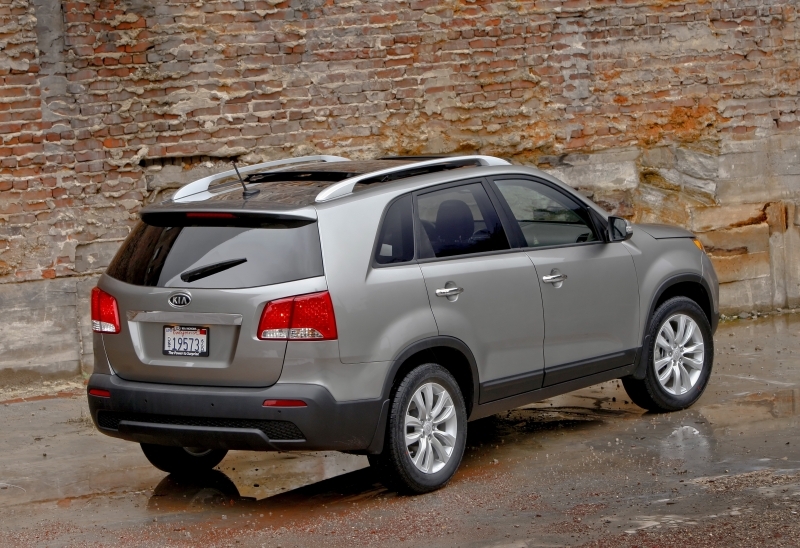 As far as compact CUVs go, the Sorento does a great job of handling whatever comes its way. New suspension components smooth over bumps in the road and make the ride supple, but not without feel. The Sorento also corners well considering its hefty curb weight and stays level throughout the ride with minimal pitch and roll. Brake feel, however, is as vague as the dead-center steering is sharp, making it difficult to determine whether the ride is distinguished enough to set it apart from its competition. The two engine choices give drivers a varied ride, with the new four-cylinder option being a solid pick for those not interested in excess might. The V-6 has more consistent power delivery, but it’s hampered by the sluggish transmission. Regardless, the overall drive is a quiet, easygoing affair highlighted by a comfortable cabin space and significant noise reduction. The Sorento LX and EX are available with a 172 hp and 166 lb-ft of torque 2.4-liter inline four-cylinder engine, while the EX-V6 is powered by a 2.5-liter V-6 that produces 273 hp and 247 lb-ft of torque. 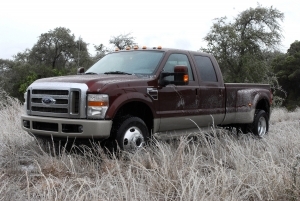 Both engine options are mated to a proprietary six-speed automatic transmission with manual shift mode. Drivers have a choice of front- or four-wheel drive, and towing capacity tops out at 2,000 lbs for the I-4 and 3,500 lbs for the V-6. With just a few ticks of options boxes, drivers can add some impressive items to the Sorento. Presented as two sunroofs, the optional panoramic sunroof allows the rear seats to have a full upward view and visually opens up the space. A 550-watt, 12-speaker Infinity audio system is available on the EX trims and delivers crisp, precise sound throughout the cabin. For a car that starts under $20,000, the Sorento covers more than enough bases with its technology options, though most are available on the EX trim only. An overhead DVD player with headphones is an option, as is the navigation system with real-time traffic and a rear backup camera. Bluetooth connectivity and USB/AUX audio jacks come standard on every trim. The gas mileage competition hasn’t eased up yet, which is why the Sorento’s 21 mpg city and 28 mpg highway for the FWD four-cylinder is so important. Numbers like that, as well as the V-6’s 4WD 19 city, 27 highway, are on par with direct competitors like the Honda CR-V and Ford Escape. Fuel economy for other powertrain options covers a similar range. 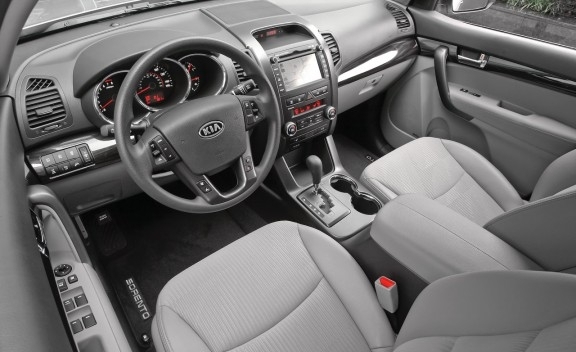 Chrome rimmed gauges, a structured and modern instrument panel and a large, optional touchscreen are just a few indications that interior styling has come along way in the Sorento. The third row of seats is clearly for youngsters, but the rest of the cabin is roomy and comfortable, with optional leather and heated front seats. The two-tone color scheme is a classy look too. Essentially a new design, the Sorento’s exterior features are more in line with the new Kia look. The new grille with integrated headlights is set above the mesh-backed fog lights. Bodylines cut through the larger panels to give the CUV a smaller appearance, while a large rear window makes up for the dominating size of the C-pillars. 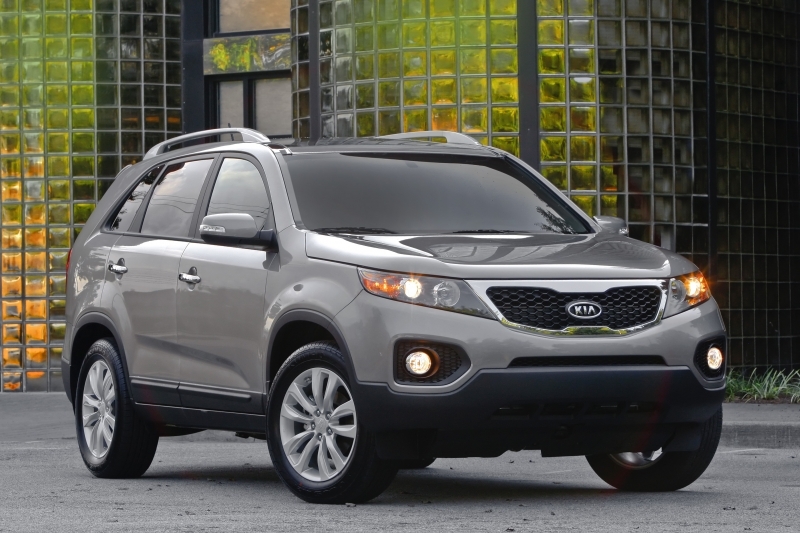 The Sorento sits on 17- or 18-inch wheels. Official pricing hasn’t been announced as of writing, however Kia has revealed that the Sorento will start under $20,000 for the LX and even a fully speced out EX-V6 it won’t break $30,000. This places it underneath the $20,550 Ford Escape, $22,440 Chevrolet Equinox, $21,545 Honda CR-V and $21,500 Toyota RAV4. Though we’re still puzzled by Kia’s choice to use the Sorento name despite this being almost an entirely new vehicle, the new CUV has proven itself a capable contender in the segment. Kia has always wowed with its low MSRPs and great warranty, but this time they have a solid design and ride quality to back them up. Kudos also go to the manufacturer for implementing useful and cool tech features into the Sorento as well. We don’t think the Honda CR-V is in any danger of being knocked off its perch by its latest competition, but the rest of the segment has reason to worry.